Since I can remember there have been problems with Magento’s built in Google Merchant Center product submission called google base in your Magento Admin. Now to align themselves with google’s new api they have released the Google Content API for Shopping extension which seems to work well enough. But like the previous versions it still has the ridiculous quirk of showing your disabled products in when you click “view Available Products.” This is plain daft as to me disabled should be considered unavailable in this context. This entry was posted in Blog, Snippets, tutorials and tagged magento, php. Bookmark the permalink. You’ve no idea how hard this was to find. Thanks – This is a big help, solved my morning headache. Thanks, this helped me too. Awesome, thanks for the enhancement! Magento’s Google products feature is not great and full of bugs and missing features. It doesnt help with google changing their requirements every month! Still, hope the team can take on board enhancements like yours to make it into a better feature for the future. I was trying to add the product visibility in the same way, but not sure where you find the exact names to create that? Also, is there any way to add this to the list of product already added to google, so that I can go through items no longer active and delete them, this would reduce errors at google of products not being found. 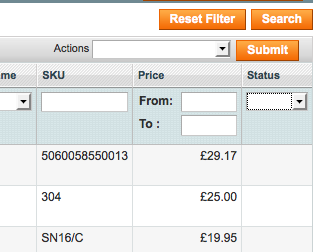 I thought the Synchronise would remove them, but I have items that are not being removed, but marked as out of stock. I thought this was fine, but have started getting errors about google not being able to crawl those products. So the products do not get listed, but google gets upset and starts talking about suspending the account because of these products. Cheers pal. I do aptecriape the writing. Hi Rob, nice one! Can’t test it but it looks pretty good from here. This still works on 1.8 if anyone is interested. Thanks for this very welcome post! You’re welcome Gary! Thanks for the update, that is good to know. Hi James, what version are you on? It says line 65 but I think the error is a little further up. Is there a way to upload files or do you have them available to you? Hi James, Apologies for the delay, just had a second sprog so things are a little crazy right now. I don’t actually have a an install of Magento to test any of this on just now and can only really vouch for Magento 1.5.0.1 at present. May have a Magento project in the pipeline, so, will definitely look when I get a chance unless you have already nailed it.